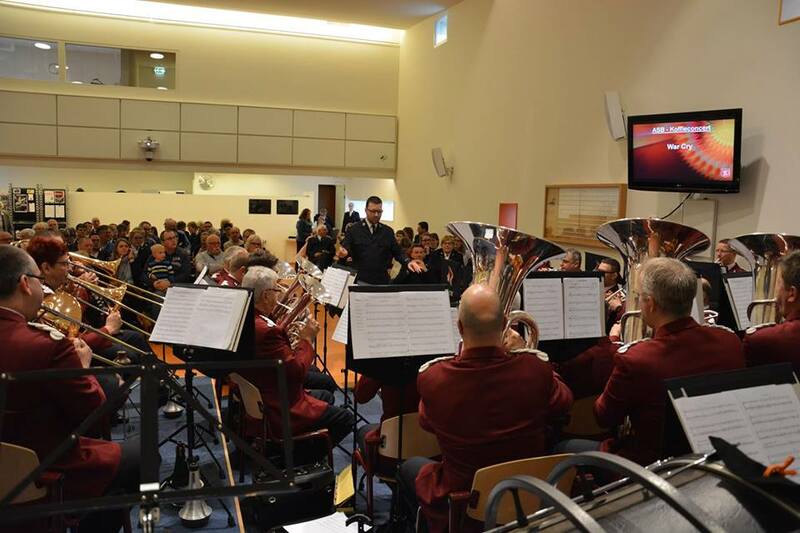 The weekend of 18 – 29 March 2015 saw the tenth edition of the Premier Brass concert series held by the Amsterdam Staff Band (Bandmaster Olaf Ritman). The guest band this year was Spijkerpakkenband, champions of the First Division, and the guest soloist was bass trombonist Brandt Attema. A well-filled church in Surhuisterveen, Friesland was the venue. Originally, bass trombone virtuoso Ben van Dijk was scheduled to be the guest soloist, however, he had to cancel because of illness. His colleague, Brandt Attema, also a well-known bass trombone soloist, was present. Attema is a world-class player and his performances during the concert did not disappoint in any way. The concert was split into three sections, with the Amsterdam Staff Band up first, then Spijkerpakkenband, and finally the bands joined together as a single group for the final section. The Staff Band kicked off the first section with Horizons (Paul Lovatt-Cooper), featuring the entire cornet and trombone sections. This was followed by an impressive 15-minute solo played by Brandt Attema, World Concerto (Steven Velhelst). The Staff Band continued with one of the great classics of Salvation Army brass band literature, Eric Ball’s Songs in Exile. Attema returned for another solo, this one a fresh, new arrangement of the Founder’s Song, O Boundless Salvation. The last item of this section was Vain Resistance, written by Staff Bandmaster Ritman. The Spijkerpakkenband started the second third of the program with the Finale from the ballet Faust (Charles Gounod, arr. Roy Newsome), a terrific and impressive start, showcasing their beautiful sound. This was followed by Scherzo for Motorcycle and Band (John Williams, arr. Titus and Klaas van der Woude) and the always-impressive A Little Prayer (Evelyn Glennie, arr. Robert Childs). Brandt Attema then impressed the audience again with an unbelievable rendition of Capriccio (Steven Velhelst), including low notes, very low notes, and extremely low notes. An arrangement of Yellow (Coldplay, arr. Dean Jones) was followed by their final item of this section, Steven Ponsford’s Turris Fortissima. The final section of the program featured the two bands as a massed group, with the conducting duties split. First, Bienze Ijlstra took the podium and conducted Make His Praise Glorious (Bill Wolaver, arr. William Gordon) and To My Country (Bernard Zweers, arr. Marten Grond). Then Bandmaster Ritman took over, conducting the final bass trombone solo from Brandt Attema, an amazing performance of Milonga Sin Palabras (arr. Steven Velhelst). To conclude the concert, the acoustics of the church were tested to their limits as the bands joined in Leslie Condon’s masterpiece The Call of the Righteous. The Amsterdam Staff Band spent Sunday at the Leeuwarden Corps. Because of illness, principal euphonium Michel Rosenquist was not available, so Staff Band alumnus Simon Smedinga, bandmaster of the Leeuwarden Corps Band, filled in – impressively, sight-reading most of the pieces. The morning service was done in the usual way, supported by the Staff Band. After the morning meeting was a one-hour concert. The opener was War Cry (Dorothy Gates) with its repeated theme of “Victory, victory!” This was followed by a subdued rendition of Ave Maria (arr. Kenneth Downie). Then Bandmaster Ritman announced the “tryout” of a new cornet solo that he wrote for Steef Klepke Jr, the Staff Band’s principal cornet, entitled Rhapsody for Cornet. This new work features the beautiful melody “I’m in His Hands”. The music of Sam Creamer is, although still new to many, a firm part of most of the Staff Band concert programs. So it was on this occasion as the band presented Creamer’s Telling It!. The band’s principal euphonium had planned to play the beautiful Benedictus (Karl Jenkins), but, as he was not present, his replacement played it flawlessly despite not having rehearsed the piece. The “big” piece for the concert was Kenneth Downie’s Guide Me, O Thou Great Jehovah, a heavy blow for the band, which tells the story of the Israelites escaping from Egypt. Despite all the other great music played during the weekend, the highlight, judging from the audience reaction, was when the Staff Band’s principal cornet challenged one of the youngsters from the Leeuwarden Corps to play the duet The Happy Warriors (Erik Silfverberg) with him. A great performance was the result, with the young man changing into a red Staff Band festival tunic before. Two more items closed out the weekend. The first was the popular arrangement by Kevin Larsson of his father’s melody They Shall Come from the East. This was followed by an encore, the first-ever performance of a new quick march from the pen of Bandmaster Ritman, entitled Triumphant Prospect. This article was posted in News and tagged Amsterdam Staff Band, Ben van Dijk, Bienze Ijlstra, Brandt Attema, concert, Michel Rosenquist, ministry weekend, Olaf Ritman, Premier Brass, Simon Smedinga, Spijkerpakkenband, Steef Klepke on 20 May 2015 .